A very special Wildwood "10" in heavily relc'ed Sea Foam Green. This guitar has some seriously beefy tone! The finish on the neck feels fantastic and natural as well. This rare and unique guitar has tons of personality. 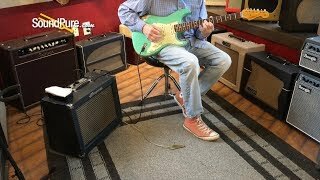 In this video, Sound Pure guitar specialist Eddie Berman tests out a distressed Fender Custom Shop Wildwood "10" '61 Strat #R61554 - Used, through a magical, vintage Ampeg 1962 R-12 Rocket Combo Amp #302342.